Today, we’ve listed down some of the best products that we have found on offer on Amazon. The TVs in the list down below are bigger than 40-inches and includes smart TVs, Full HD TVs, and more. Sanyo 49-inches LED TV Price: Rs 47,990 Deal price: Rs 26,999 The Sanyo 49-inches LED TV offers a resolution of 1920 x 1080 pixels with a panel size of 49-inches. The TV comes with IPS A+ grade panel, which enhances your viewing experience. The TV has three HDMI ports, two USB ports, and one VGA port to connect external devices like Fire TV, camera, flash drive and more. Click here to buy. 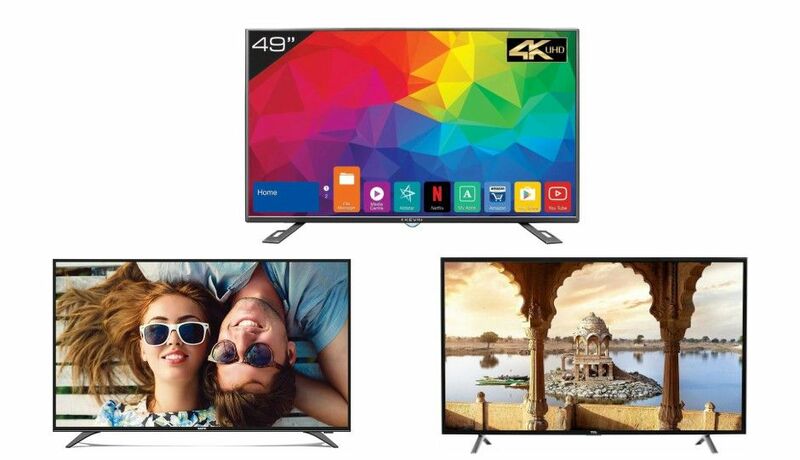 Kevin 49-inches 4K LED Smart TV Price: Rs 49,990 Deal price: Rs 29,990 The Kevin 49-inches 4K LED Smart TV offers a resolution of 3840 x 2160 pixels, which is four times more than the regular full HD LED TVs. The TV comes with a built-in Wi-Fi that lets you connect the TV to your home network and download apps like Netflix, Youtube, Hotstar and more. Click here to buy. TCL 49-inch Full HD LED Smart TV Price: Rs 40,990 Deal price: Rs 28,990 The TCL 49-inch Full HD LED Smart TV offers a resolution of 1920 x 1080 pixels. The TV comes with built-in Bluetooth that lets you connect a headphone or a speaker to the TV directly. As it is a smart TV, users can download a variety of apps on TV such as Netflix, Youtube and more. Click here to buy. Daiwa 49-inch 4K Ultra HD LED Smart TV Price: Rs 49,990 Deal price: 29,990 The Daiwa 49-inch 4K UHD LED Smart TV offers a resolution of 3840 x 2160 pixels. The TV has built-in Wi-Fi that lets you connect the TV to your home network and download apps like Netflix, Youtube and more. It has 1GB RAM and 8GB internal storage. Click here to buy. BPL 49-inches 4K Ultra HD LED Smart TV Price: Rs 47,990 Deal price: Rs 35,990 The BPL 49-inch 4K UHD LED Smart TV allows you to surf the internet via Wi-Fi on your TV. It has a Miracast function that lets you watch the content of your smartphone on a bigger screen. The TV comes with 8GB internal memory for your apps. Click here to buy.